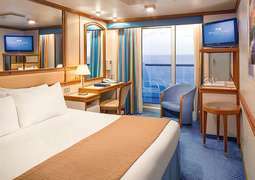 The pride of the grand-class ships, the Caribbean Princess recently underwent a multi-million-dollar renovation, bringing new activities, improved dining options and new destinations to passengers. Modern furnishings create a more stylish atmosphere and improve upon passenger comfort. Expanded children’s activities and an increase in the number of connecting staterooms make the ship more welcoming for families. And the recently-introduced Ocean Medallion allows for a more personalized cruise experience. Introducing: the Princess Luxury Bed. 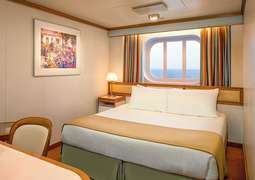 The Caribbean Princess is one of several ships in the Princess fleet to be outfitted with a new class of bedding in its luxury suites to ensure a more restful night’s sleep. Developed by sleep expert Dr. Michael Breus, the bed features a supportive medium-firm mattress topped by a two-inch plush pillow top. Luxurious woven cotton sheets and an assortment of pillows complete the setup. With the Caribbean Princess’s 2017 refurbishment came an expansion in fine dining. While popular classics such as the Crown Grill Steakhouse and the Curtis Stone gourmet dining experience were left untouched, the poolside Salty Dog Grill got an upgrade to include more gourmet options, and a seafood restaurant and a barbecue were introduced. Perhaps the most impressive new restaurant is Sabatini’s Italian Trattoria, an acclaimed specialty restaurant serving authentic Italian five-star cuisine. The popular Movies under the Stars has also been updated, with a high-definition screen, improved sound system and wider screen giving moviegoers that true movie theater experience. An updated top deck bar encourages a lively atmosphere with its bright colors and well-lit seating area, and the new and improved Coffee & Cones provides sweet treats and hot beverages the whole family can enjoy. Princess regulars won’t miss out on their favorite live entertainment shows, with popular productions such as “The Voice of the Ocean” singing contest and the Broadway-style musical “Magic to Do” taking place in the Princess Theater. 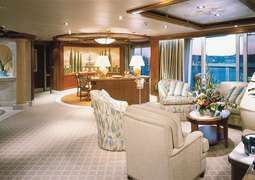 While Princess cruises are known for their laid-back atmosphere, the dress code on board the Caribbean Princess is more like smart casual, with most passengers wearing long pants during the day and dress pants, collared shirts or blouses encouraged for evening dining. On formal night, dresses and tuxedos are required to attend dinner at the onboard restaurants. Even on formal nights, the ship’s buffet remains casual, with anything except beachwear allowed. The Caribbean Princess joined Princess Cruises’ impressive Grand-class fleet in 2004 and has many exciting new features, one of which is the Italian-inspired Piazza-style atrium. The Caribbean’s 17 wide-open decks offer many dining and entertainment options to keep its guests satisfied. Caribbean Princess is a large resort ship, however fairly intimate and features some of the state-of-the-art amenities. Onboard the fabulous Caribbean Princess, you will find absolutely everything you are looking for to make your cruise an unforgettable experience. Step on board the Caribbean Princess and experience the royal treatment while sailing to the Caribbean and exploring Panama Canal in all its grandeur. When you choose to cruise with Caribbean Princess, you can expect a sun-laden and tranquil tropical experience embarking from popular ports like Port Everglades, Fort Lauderdale. Palm Dining Room, a traditional dining area offers you a traditional cruise dining experience with a pre-selection of one of two seating times and you can expect the same great service throughout the whole cruise. Alternatively, you could try one of the specialty restaurants, such as the Crown Grill serving great steaks and seafood or sample some great dishes of traditional Italian cuisine at Sabatini’s. Dining on board the Caribbean Princess is a joyful celebration and all the specialty restaurants deliver an extraordinary experience. 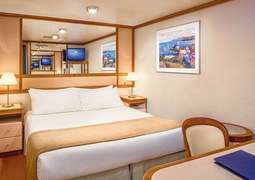 In addition to its dining and beverage innovations, Caribbean Princess features some modern family activities, including Camp Discovery Youth & Teen Centers, the successful Movies Under the Stars with a huge poolside screen, Princess Luxury beds, and interconnecting cabins. Cruises with the Caribbean Princess offer you an ideal cruise vacation. Caribbean Princess has an excellent range of on-shore programs for many ports of call. Should we not have your ideal cruise here on our website, or you just simply require more information about cruise deals then simply give us a call 1-888-403-1425!